Let’s start with the BRS basics—the general rules regarding eligibility and length of service, as well as the implementation timeline. Who are the U.S. uniformed services? Uniformed services include active members of the Navy, Air Force, Army, Marines, and Coast Guard, as well as cadets and midshipmen at service academies. Uniformed services also include the National Oceanic and Atmospheric Administration and the U.S. Public Health Service. Reserve members of the Navy, Air Force, Army, and Marines are also uniformed services, as are the U.S. Army National Guard and the Reserve Corps of the Public Health Service Commissioned Corps. 12 or more years of service: Individuals who joined active service in 2005 or earlier are grandfathered into the legacy pension. 1 year to 11 years of service: Individuals who joined active service between 2006 and 2017 are eligible to choose either the legacy pension or the BRS. Personnel who left active service after fewer than 12 years and decide to rejoin the military after 2018 will have 30 days after reentry to choose between the legacy pension and the BRS. Joined the military in 2018 or later: These individuals will be automatically enrolled in the BRS. 4,320 retirement points (i.e., 12 years of service): Members are grandfathered into the legacy pension. Fewer than 4,320 retirement points: Members are eligible to choose between the legacy pension and the BRS. Enrolled before December 31, 2017: These individuals are grandfathered into the legacy pension. Enrolled before December 31, 2017, but commissioned after 2018: These individuals are eligible to choose the BRS within 30 days of their commissioning date. Enrolled after January 1, 2018: These individuals are automatically enrolled in the BRS. Eligible active service members, reservists, and National Guard members have from January 1, 2018, to December 31, 2018, to choose either the legacy pension or the BRS. Personnel who do not make an affirmative choice will remain in the legacy pension. Once the choice is made, however, it is irrevocable. As such, eligible personnel must complete mandatory training. To help you understand the BRS defined benefit, let’s compare it with the legacy pension. Lump sum. The BRS pension has a lump-sum option that the legacy pension does not offer. Retirement from the military often occurs several years before social security full retirement age. A retired service member may elect to receive either 25 percent or 50 percent of his or her pension as an up-front cash lump sum. This payment reduces the monthly pension to 75 percent or 50 percent, respectively, of the full amount. The monthly pension returns to its full amount when the retired service member reaches full social security retirement age. Thrift Savings Plan (TSP) automatic and matching contributions. The military’s TSP is not new. Since 2001, service members have been able to contribute a percentage of their base pay, special pay, or bonus to traditional pretax or Roth after-tax investment funds. Individual contributions cannot exceed the annual deferral limit set by the IRS. What is new? 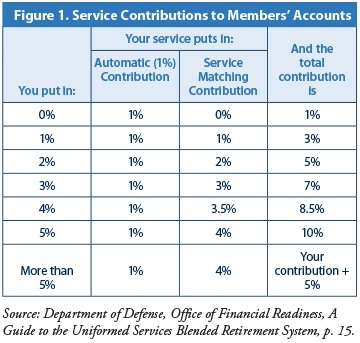 The automatic and matching contributions from service branches under the BRS. Each service branch will make an automatic contribution and a matching contribution to a service member’s TSP account. 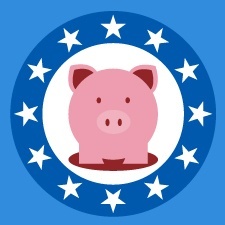 The service branch’s automatic and matching contributions are a percentage of base pay only. Figure 1 outlines how the service branch’s automatic and matching TSP contributions work. The automatic service contribution equals 1 percent of a service member’s base pay. For service members who opt in to the BRS, the automatic 1-percent contribution begins immediately. If the service member already has two years of service, the automatic contribution will vest immediately. For new service members, the automatic 1-percent contribution begins after 60 days and will vest after two years of service. Service members may contribute a portion of their base pay to their TSP. After two years of service, the service branch will match up to 4 percent. The maximum contribution from any service branch is 5 percent (1 percent automatic + 4 percent matching). A service member’s own contributions vest immediately, irrespective of length of service. The service branch’s matching contributions also vest immediately for personnel who have two years of service and opt in to the BRS. All vested automatic and matching TSP contributions are portable and may be rolled into a qualifying retirement account. Continuation pay. Continuation pay is an added benefit offered by the BRS that is not available under the legacy pension. Personnel who have between 8 and 12 years of service and are covered by the BRS may receive a one-time bonus if they commit to extending their service. The minimum commitment is three years, and the bonus amount is discretionary. Now that we’ve covered the BRS basics, let’s turn to the retirement planning opportunity. It’s important to note that the introduction of the BRS does not affect service members covered by the legacy pension. This group includes service members who are already retired or who began their service before 2005 and are grandfathered into the legacy pension. Still, the legacy pension does not mean a lack of retirement planning opportunities for advisors. Often, service members who retire after 20 years start a second career. In those cases, you can help coordinate a military pension with a private-sector 401(k) social security plan. Service members who joined the military between 2006 and 2017. These individuals present the most significant opportunity for you. The magnitude of their choice to remain in the legacy pension or to opt in to the BRS cannot be overstated. Personnel in this group can have as many as 11 years of service or as little as 1 year, and they may be uncertain about their long-term career plans. Both the legacy pension and the BRS defined benefit require 20 years of military service. But the legacy pension’s percentage multiplier (2.5 percent) is higher than that of the BRS (2 percent). The legacy pension is considered the better option for service members who plan to stay in the military for 20 or more years. But this choice is not without risks! If a service member does not reach the 20-year mark, he or she will leave the military without a pension. Here, you’ll want to keep in mind that the Department of Defense estimates that only 19 percent of active service members and 14 percent of reserve members reach the 20-year mark and qualify for a military pension. “What-if” variables. Your analysis of the “what-if” variables will provide valuable insight into what the BRS choice means for retirement plans. For example, if a client has been in the Navy for 11 years and is likely to stay in the military for 9 more years, illustrate how a legacy pension would be one part of a retirement plan. If this client is thinking of leaving the military before the 20-year mark, demonstrate what the loss of the pension could mean to his financial security. Or, if a client has been in the Air Force for only five years and is unsure about her career plans, calculate the difference between the legacy pension and the BRS pension. If this client doubts that she will stay for 20 years? Demonstrate how the TSP’s automatic and matching contributions will determine the amount of her portable retirement assets. Beyond pensions. Of course, your guidance should not be limited to the choice between the legacy pension and the BRS. Suppose a client decides to opt in to the BRS. He will need advice on whether to invest his TSP into a traditional pretax fund or an after-tax Roth fund. You might show a midcareer service member how the one-time continuation bonus could be invested and factored into an overall investment strategy. If the client reaches 20 years of service, illustrate whether the 25-percent or 50-percent cash lump sum is a good choice in the same way you analyze lump-sum payouts from a private corporation. The military is the first job for many individuals. As such, I think you will find that new service members covered exclusively by the BRS present a chance to educate younger generations about retirement planning. Their assets, income, and knowledge of financial planning will be limited. The advice you give may be pro bono—but it will be meaningful. Have you had the opportunity to discuss the BRS with your clients who are service members? Are there "what-if" variables that have emerged in your discussions? Please share your thoughts with us below!